Mandi of “Vintage Revivals” started clearing out her stash and every month they are celebrating clearing a project out of their stash of unfinished hopes and dreams pile. Her project this month is more of an idea hoard, and not so much an actual hoard. You know when you have an idea and it just hangs out, in your mind, resurfacing when you least expect it? 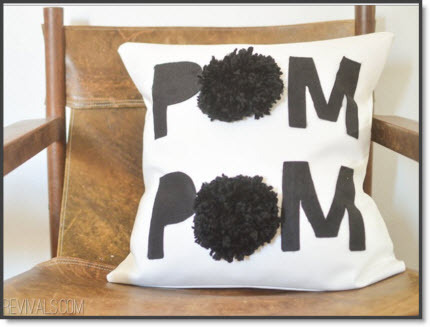 Yes, her “Pom-pom Pillow” is one of those projects she also shows you how to make a giant pom-pom. Mandi has a very unique site that you will want to visit. She won the best home projects and DIY blogs on Apartment therapy. Congratulations Mandi and thank you for sharing your incredible project!